Mummy Decapitated At St Michan's Church In Dublin "These are people who have been lying at rest for years and years and to have them desecrated in such a sacrilegious way is so distressing and disturbing," the Archbishop of Dublin told local media. 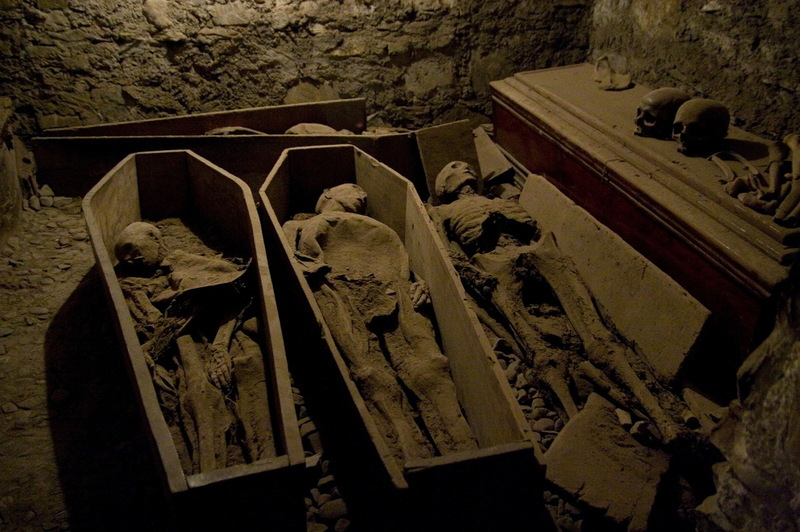 St Michan's Church in Dublin, where vandalized mummies have been discovered, has a series of crypts. "They broke open that vault, it's a big heavy steel door, and broke open one of the coffins," Archdeacon of Dublin, David Pierpoint, told The Irish Times. "Parts of the contents of the coffin have been dragged out." The archdeacon added, "These are people who have been lying at rest for years and years and to have them desecrated in such a sacrilegious way is so distressing and disturbing. I can't put it in words, I'm quite disgusted." In the Church statement, Pierpoint had a request for the vandals: "I would appeal to those responsible to examine their consciences and return the head of The Crusader to its rightful place." The church, which was founded in 1095, is home to five crypts housing the mummified corpses of prominent Dubliners, many dating from about 1600 to 1800. It's a significant tourist draw, with some 27,000 visitors annually, according to RTE. The site's tours have been cancelled for now, the broadcaster reported. Pierpoint told RTE that because the vandals broke open the vault, they're worried that the open air conditions will further damage the mummies. Ireland's police service, An Garda Síochána, is investigating the incident. This isn't the first time the collection of mummies at St. Michan's has been hit by vandals. In 1996, intruders damaged dozens of corpses. RTE reported at the time that thieves removed some 40 mummies from their coffins and made piles of their bones. Pierpoint remembered a chilling detail in an interview with the Times. "They dragged them up onto the ground and seemed to be playing football with the heads," he said. "Thankfully at that time the guards did their jobs extremely well and they caught the perpetrators."